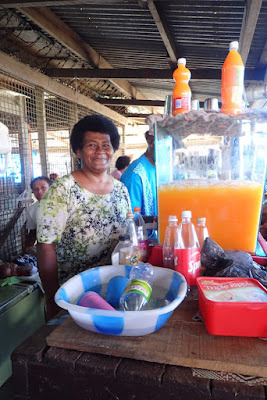 Fruit juice lady, Labasa's market. FIJI. While Savusavu is Vanua Levu’s cruiser mecca, Labasa is this second biggest island of Fiji’s “big smoke.” Savusavu’s population is ~ 3,500; Labasa’s ~30,000. Savasavu’s population swells with cruisers, influencing the relatively small local population, peopled with a noticeable chunk of expats (mostly from the US, New Zealand and Australia) as well as locals* and cruisers. A little more growth and you might expect a Mickey D’s, as there was in Suva. * A mix of “pure” Fijians and other Pacific Islanders, Chinese, East Indians and a blend of those cultures. Fiji. Labasa's market. One portion in one of its two sprawling buildings. Labasa, near Vanua Levu’s Northern point, is a whole ‘nuther world. do dress up this much, too! Fiji. Beginning 1879, a tide of indentured servants from India swept in to work Fiji’s cotton and sugar cane fields. Sugar cane is still Fiji’s #1 economic driver, and Labasa is one of the country’s primary areas for growing and processing the cane. Today, no longer indentured servants, the predominating Eastern Indian culture imbues this bustling, dusty town with its vibrant, exotic culture. 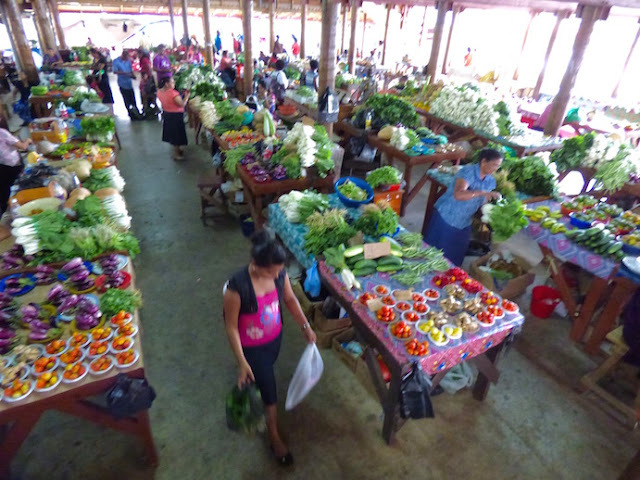 Bananas, plantains, papayas, passion fruit… few if any made their way into Savasavu’s produce market. 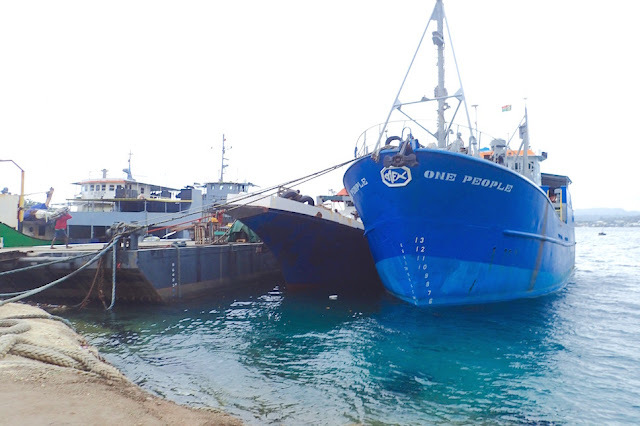 Cyclone Winston ravaged Savausavu’s fruit production, Labasa survived comparatively untouched. We’d heard these local treasures were readily available in Labasa. Besides, busses are a wonderfully cheap way to get a good overview of an island. Over 100 clicks and a few hours ride away, a trip to Labasa was a no-brainer for us. were all this overloaded or more. provides a comparative sense of scale. Vanua Levu, Fiji. Atypically, we decided to catch the express van, which was just a few dollars more, $10 FJD/person, versus $8 FJD/person. We’re more a fan of local busses, so we planned to either take one back, or make another trip on one. The “7:30 am” van left at 8, and arrived in Labasa at 10:30. 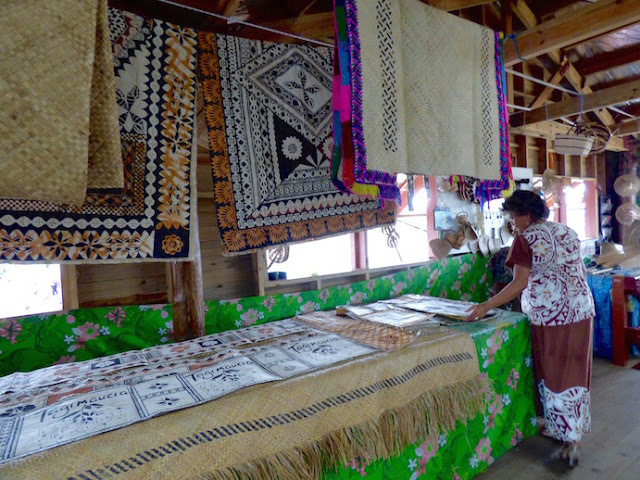 Labasa market. 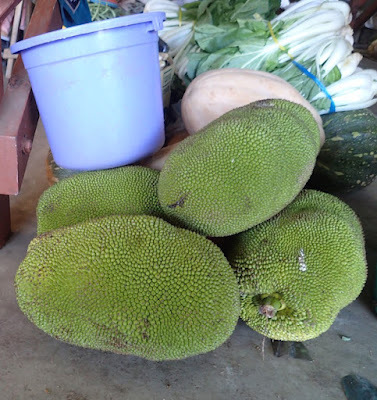 Buyers add this starchy fruit to curries. Fiji. While the trip takes a while, the scenery whooshes by far more quickly that you can whip out a camera and figure out how to take a shot without a part of the bus or someone’s head blocking part of the oft spectacular scenery. More about that in a future post. Handcrafted floor coverings, painted tapas and woven pandanus mats for sale at Labasa's market. Fiji. We ambled over to Labasa’s sprawling produce market, satisfying both thirst and hunger by downing a shared 1 liter “Coke” bottle of freshly squeezed fruit juice. 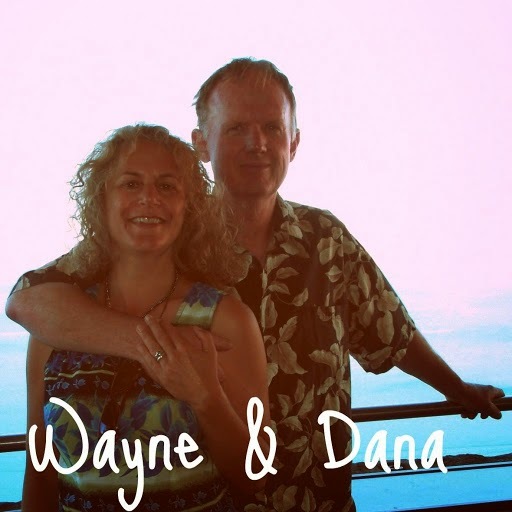 Indeed, to our delight we did find and purchase bananas, plantains, passion fruit and papayas. Still, Suva’s Central Market offered far greater variety. 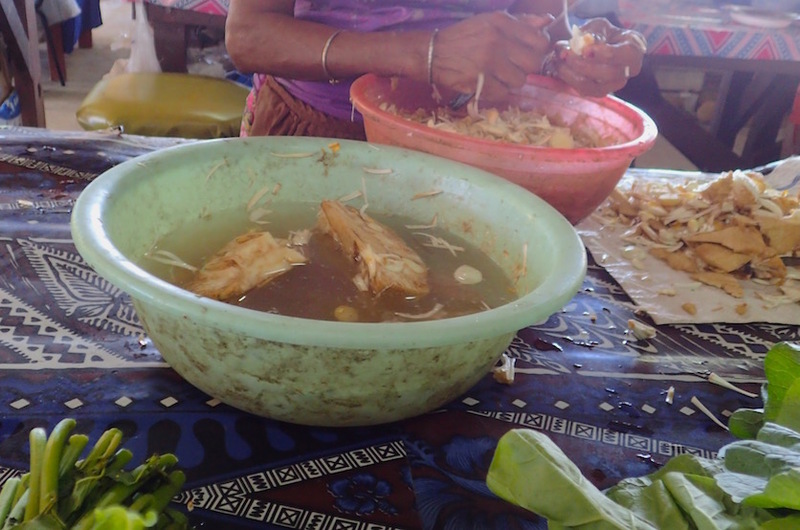 Also, while Labasa’s kava was grown on the island, Vanua Levu, Suva market’s kava came from Kadavu, regarded as the best, worldwide. 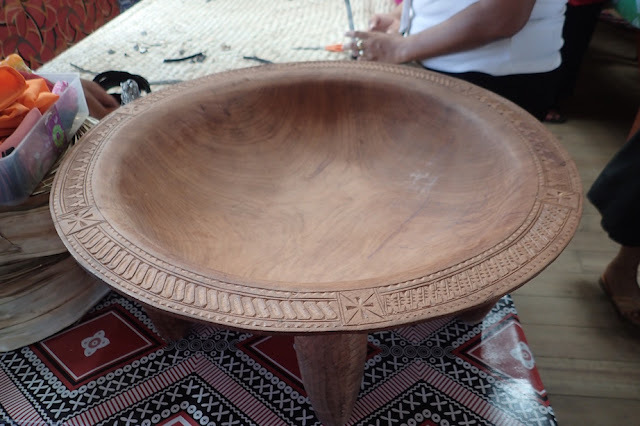 Carved kava bowl at Labasa market. 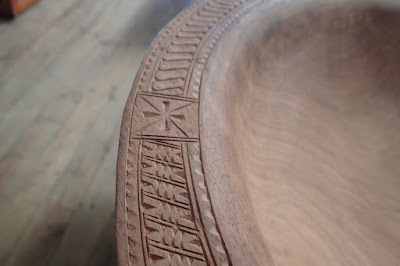 This is the most beautiful kava bowl I've seen. Fiji. 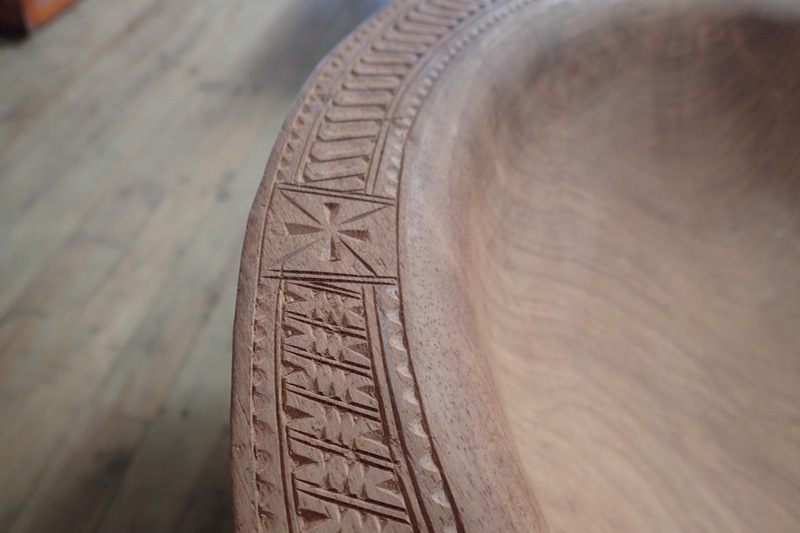 Closer look at the fine quality of carving on this kava bowl. Labasa, Fiji. When I asked one of the market ladies how to learn more about cooking with the local produce, she offered to take to her place for cooking lessons if I was interested. I was, but given Labasa’s distance, it struck me as interesting but overly logistically challenging. While the boys ducked into a coffeeshop, us gals checked out the handicrafts section upstairs, ooohing and aaahing in particular over the painted tapas, ranging in size from placemats to substantial area rugs and large pandanus mats, some getting woven on real-time, on location. 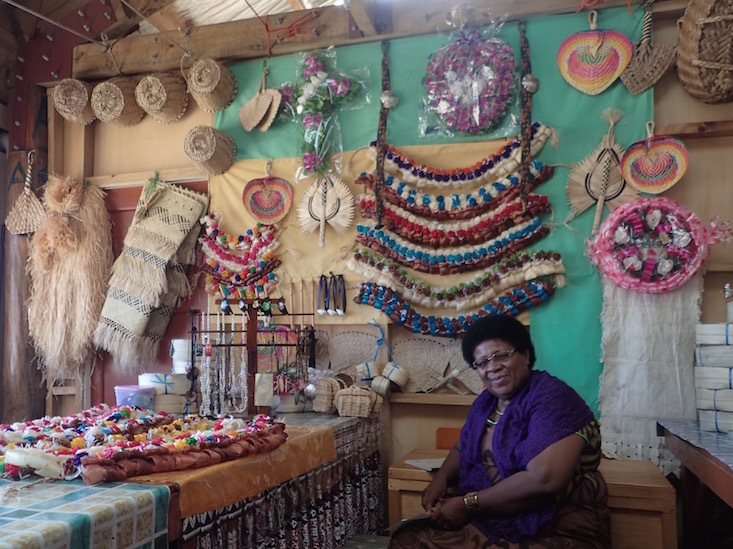 Purchased a small horn pendant from this Labasa lady. She was a bit vague about what it was made of. Fiji. Despite the handicraft section, shops and a plethora of eateries, overall, Labasa is not a tourist town. This hip Labasa mannequin was not turbaned. 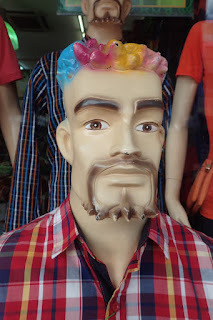 for his next hairstyle. He didn't. Fiji. Still, one feels otherworldly transported. Graceful women with café au lait skin and long, jet-black hair dress like princesses, swathed in brightly colored layers of shimmering and gauzy fabrics, sparkling with sequins, beads, pearls, gold and silver. Some of the men stand tall in their stately turbans. 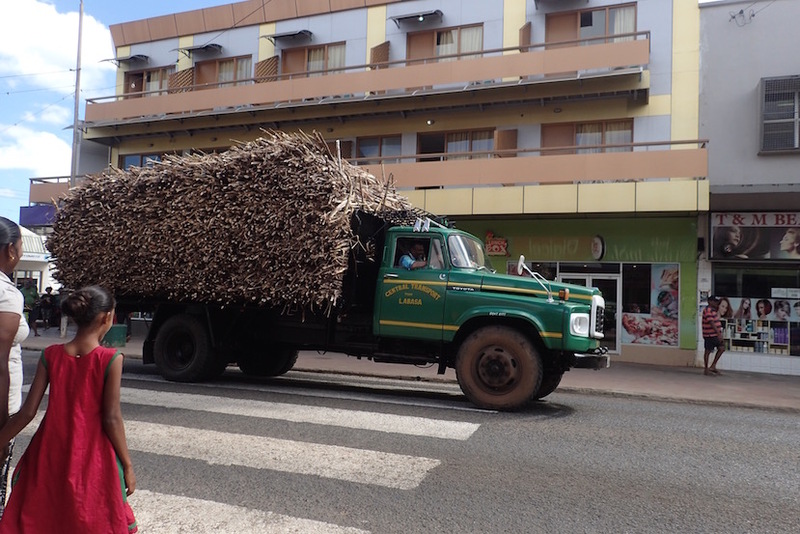 Trucks overloaded with cane lumbered through town assertively taking right of way over way over pedestrians. Instead, we gawked, shopped, ate and in general dawdled. We searched in vain for Trip Advisor’s much vaunted cheap and delicious Horseshoe Restaurant – apparently no longer in existence. The lack of patrons in most restaurants gave us pause, though we later attributed it to the carnival tempting customers away (not us as we already went to it in Savusavu). Other more popular restaurants appeared unclean and overly limited in their gluten-free options. 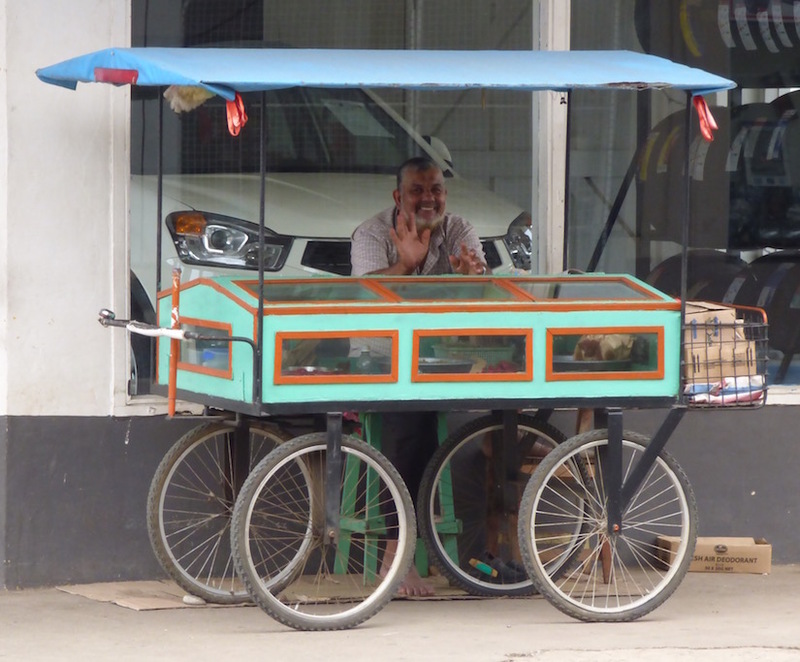 Labasa's only food cart vendor. He sold spicy little burras. They were good. Vanua Levu, Fiji. I did manage to temporarily stave off our hunger with the tiny discus shaped, spicy fried burra, purchased from the only food cart we saw. Like bhuja (more on that salty-crunchy snack in a future post) burra is gluten-free as it’s made from a ground lentil pea flour. 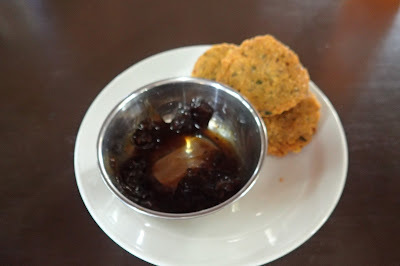 Burras with tamarind dipping sauce at Decked Out Cafe, Savusavu. Eventually, we settled on The Oriental, adjacent the bus depot and market. Despite its lackluster concrete box exterior, The Oriental was quite clean inside. Each of the five of us ordered a different dish to share, the winner was a black bean-gingered beef dish. It takes a while for five folks to order and eat. An hour and a half later, we realized we were quickly running out of time. We’d heard the bus back could return quite late. The express van was due to leave at 2:30. We swung by at around 1:45, saw it already there and nearly fully loaded. We clambered aboard. His van now full, without further ado, the driver left. We arrived back in Savasuvu – “cruiserville” -- a bit before dark, grateful to be back and appreciative of all-too-short a glimpse of a culture still intriguingly foreign to us. Spectacular Sawa-i-Lau, Yasawas, 10 miles from our current location, anchored off Blue Lagoon Resort. Fiji. Yes, this is my photo and it really does look like this! We are currently in Fiji's Yasawa islands, anchored off Blue Lagoon Resort, Nacula island (S16.54.761 E177.23.024). 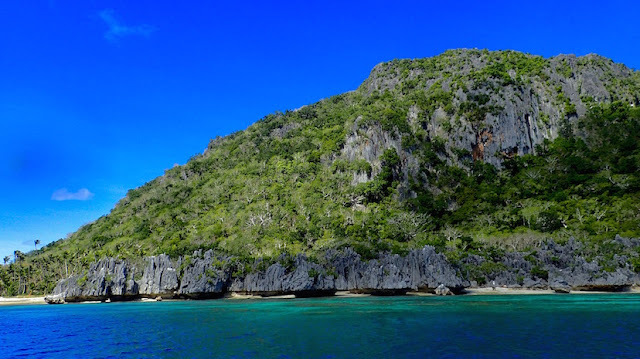 We visited Labasa while anchored off Savusavu, Vanua Levu, Fiji (S16.46.706 E179.19.785).